Capital Ship Management Corp. and Liberty One Announce the Acquisition of Two High Specification Container Vessels ‘Asterix’ and ‘Apostolos II’ by their Joint Venture: “Capital Liberty Invest”. Athens, Leer, January 30, 2019 Capital Liberty Invest, the joint venture between Capital Ship Management and Liberty One, recently acquired its first two high specification feeder container vessels which will come under the technical management of Liberty Blue in Leer, Germany. 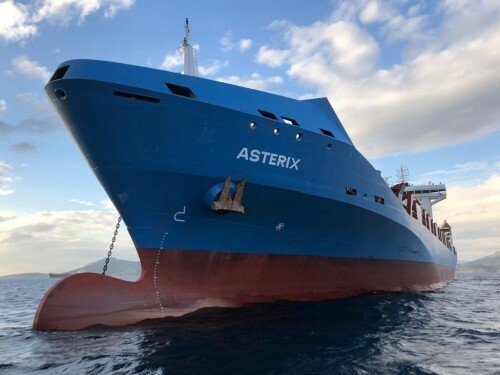 The first of the two sister ships, ‘Ibrahim Dede’ (1,878 TEU), which was renamed ‘Asterix’, has been successfully taken over on January 21 in the port of Piraeus, Greece and subsequently delivered into charter to one of the world’s leading container operators. The takeover of the second vessel, ‘Cafer Dede’, is expected at the end of the first quarter of 2018. She will be renamed ‘Apostolos II’. Both the ‘Asterix’ and ‘Apostolos II’, have been built in 2008 at the well reputed shipyard Sedef in Istanbul. The vessels are built to high specification with attractive speed/consumption profile and have been already retrofitted with ballast water treatment systems simultaneously with passing their special survey in 2018. The acquisition of the two vessels, 12 months after the establishment of Capital Liberty Invest, has been preceded by considerations of a number of projects across different shipping segments and inspection of numerous vessels. Capital Liberty Invest will continue to seek further growth opportunities in the dry bulk and container segment. About Capital Ship Management Corp.
Capital Ship Management Corp. is a distinguished oceangoing vessel operator, offering comprehensive services in every aspect of ship management. The Capital Group currently operates a fleet of 77 vessels including 49 tankers (10 VLCCs, 4 Suezmaxes, 8 Aframaxes, 26 MR/Handy product tankers and 1 small tanker), 4 modern Capesize bulk carriers, 20 container carriers and 4 LNG carriers with a total dwt of 8.22 million tons approx. Liberty is a one stop shop for the maritime industry. Designed to combine amongst others ship management by Liberty Blue, experience in asset trading and a strong standing in the German shipping market.